THE BATTLE OF NEIGHBORS OVER TREES! We live in a beautiful area resplendent with trees. In addition to providing an idyllic environment, the trees can also be the subject of much conflict among neighbors – for views, shade, cooling, aesthetics, and property value. As Barri K. Bonapart has said "It's never about the trees!" I met Barri when she was an advocate in a case I mediated. She was forceful for her client, really knew the science of trees and the process of resolution, but most impressive was her persistence in resolving the conflict to bring peace among neighbors who had to live together when the conflict was finished. 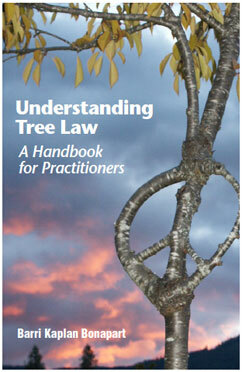 I chose to interview her to learn some of her "tree wisdom" and to let you know about her cool new book, Understanding Tree Law, A Handbook for Practitioners. BSM: Barri, what is tree law? BB: Any dispute between people over trees is what I call "Tree Law." That can include view disputes, fights over debris and mess from trees, root or limb encroachments and property damage from those encroachments, shading of solar panels, concerns over safety from falling limbs or whole tree failure, and personal injury or wrongful death claims stemming from those failures. Really, even though the subject of the dispute may be a tree or trees, the core of the conflict often stems from a basic misunderstanding between neighbors. Whether as an advocate or a neutral, I try and help people explore and understand what might be underlying the dispute so that we can get past the positions. Creative solutions can arise from a mutual understanding of the parties' needs and interests. BSM: What are the legal resources of which practitioners need to be aware? BB: Laws concerning trees arise from statutes found in several different codes. By way of example, how you determine who owns a tree is found in the Civil Code. There are multiplier statutes for trespass and damage to trees both in the Civil Code and Code of Civil Procedure. The Penal Code has several code sections making it a crime to remove or damage trees. Interference of trees to sunlight reaching solar energy systems is found in the Public Resources Code. The Business & Professions Code has rules governing the conduct of licensed contractors such as professional arborists. Even the Government Code has provisions concerning proper pruning of trees. In addition to state statues, many municipalities also have ordinances and regulations, which govern trees including tree protection laws and view and sunlight protection laws. For example, Tiburon, Belvedere, Sausalito and Corte Madera have view and sunlight Ordinances. These same jurisdictions, as well as others, such as Mill Valley, Fairfax and Novato have tree protection ordinances. Finally, CC&R's can come into play with subdivisions that have tree planting, tree removal, or view protection provisions. Of course, there is also the common law, which touches upon all of these subjects. BSM: What inspired you to write this book? BB: There really has not been a definitive work in California on Tree Law until now. Practitioners are often surprised to find how complex an area it can be. I think most lawyers get their first "tree case" and think, "how hard can it be?" Most end up concluding that it is one of the most difficult areas of law for a practitioner or neutral. That is right before they swear off ever taking another tree case. I thought I was in a relatively unique position to offer knowledge and insights into this specialty that will assist advocates with providing the most effective representation of their clients, as well as assist neutrals with helping parties resolve these contentious disputes. BSM: What do you mean by your comment "It's never about the trees"? BB: In the book, I provide concrete examples of the personal dynamics between people that can lead to misunderstandings for which the trees are merely "lightening rods." I pose the questions we should be asking when trying to help our clients resolve their problems. As I state in the first chapter, "How are we as professionals best equipped to help our clients solve their disputes? How do we help uncover the dynamics creating the problem? Once we have a better handle on the emotional component underlying the dispute, how does that knowledge assist us in advising our clients?" I also advocate what I have coined, "the socially responsible practice of law." I discuss the choice we have as advocates either to be urban warriors or healers of society's rifts. "Old school principles would dictate that if the sharpest arrow in your quiver is a judicial determination, well then fire away—especially if you have calculated the odds and feel confident that you can "win." After all, is that not what we are here for? To be our clients' urban warrior leading them on to victory? On the other hand, if we are of the belief that the law can (and should) be a healing profession much like medicine used to be, then putting the quiver down and looking for new tools and devices to help clients solve their problems may be the better way—not just for the profession, but for your clients, their neighbors, their communities, and society in general." I know you usually do not hear this kind of heresy in your standard legal treatise. But I tried to set out to do something different.... and hopefully more client centric than your standard law book. Reprinted with permission from The Marin Lawyer. © 2014.